For many reasons, electric vehicles are regarded as the key element of a future environmentally friendly form of mobility, both for individuals but also for public transport and logistics. Prominent indicators for this trend are the recent decision of China to mandate a 10% share of electric vehicles sales from 2018 onwards as well as the fully electric van Streetscooter developed by DHL for logistics applications. The increased share of electric vehicles will also challenge the capacity of the power grid. While a single electric vehicle charged overnight through a standard plug (typically at around 10 A for AC charging) can be regarded as a useful complement to provide a continuous load, the parallel fast charging (up to several 100 A for DC charging per vehicle) of multiple vehicles may easily lead to overload and instability of the power grid, if not controlled intelligently. 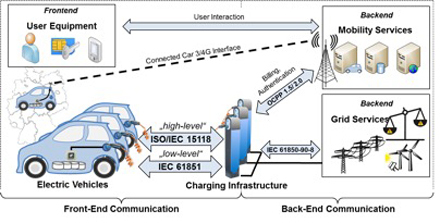 In this context, the international specification for vehicle-to-grid communications developed by the standards groups IEC 61851 and ISO/IEC 15118 play an essential role: they offer so-called “low-level” communication to provide safe electric connectivity and basic means to control the charging current depending on the capabilities of the vehicle’s battery and the power grid. A robust PWM (Pulse-Width-Modulation) signal allows for example to adapt the charging process to the availability of “green energy” from wind parks and photovoltaic. 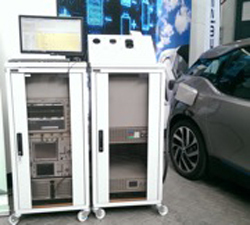 But only the so-called “high-level” communication of ISO/IEC 15118 allows for sophisticated control options and advanced mobility services for the so-called Combined-Charging System (CCS), which supports both AC and DC conductive charging. As an example, the so-called “Plug and Charge” feature allows to authenticate the user’s charging process just by plugging in the vehicle without requiring any further manual interaction of the user. This is achieved by digital certificates and a Public Key Infrastructure (PKI). The user may furthermore specify a dedicated point-in-time until when the vehicle should be charged at a certain level. The grid may then optimize across different vehicles to be charged within a certain part of the grid in order to avoid overload, apply certain tariff options (e.g. slower night-time charging vs. fast rush hour charging) and availability of preferred sources of electric energy. With the aim to integrate communication and electric power flow as tightly as possible Power Line Communication (according to the Homeplug Green PHY specification) along the charging cable has been leveraged for the CCS Vehicle-to-Grid communication. When defining the requirements for this new control communication for electric vehicles, representatives of the automotive industry, the utilities sector, and the information and communications industry work closely together. In order to avoid that early adopters of electric vehicles are annoyed by malfunctioning charging processes, an essential success factor is interoperability from day 1. A first step to achieve this ambitious goal is the development of conformance test procedures based on TTCN-3 (Tree and Tabular Combined Notation) within the ISO/IEC 15118 committee, led by the TU Dortmund University with the support of the German Federal Ministry of Economic Affairs and Energy. But the essential checkpoint for interoperability is provided by a dedicated series of testing symposia, in which pre-market implementations can be tested by all interested industry participants in an open but secure environment, facilitating the process of achieving cross-vendor interoperability. This worldwide effort is coordinated by the team of TU Dortmund since 2014 and took place already 6 times across Europe, the US and Asia. Since 2016 it is supported by the international Charging Interface Initiative (CharIN, www.charinev.org). The upcoming 7th CCS testing symposium will take place in Canada in November 2017 (www.testing-symposium.net). 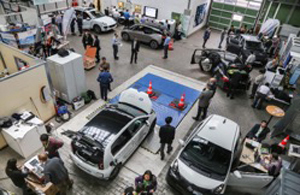 While the rollout of the combined charging system is ongoing on a large scale, new charging options, in particular inductive charging, call for wireless Vehicle-to-Grid communication. Therefore, a new initiative in the ISO/IEC 15118 standards series addresses an IEEE 802.11n-based communication option. This development ensures that electric vehicles and the power grid will be able to continue talking also along the future steps of the E-Mobility (r)evolution.